Dr. Rolf Lindemann, Nok Nok Labs, Inc.
Davit Baghdasaryan, Nok Nok Labs, Inc. Copyright © 2013-2014 FIDO Alliance All Rights Reserved. The goal of the Universal Authentication Framework is to provide a unified and extensible authentication mechanism that supplants passwords while avoiding the shortcomings of current alternative authentication approaches. This approach is designed to allow the relying party to choose the best available authentication mechanism for a particular end user or interaction, while preserving the option to leverage emerging device security capabilities in the future without requiring additional integration effort. This document describes the FIDO architecture in detail, it defines the flow and content of all UAF protocol messages and presents the rationale behind the design choices. This section describes the status of this document at the time of its publication. Other documents may supersede this document. A list of current FIDO Alliance publications and the latest revision of this technical report can be found in the FIDO Alliance specifications index at https://www.fidoalliance.org/specifications/. This document was published by the FIDO Alliance as a Proposed Standard. If you wish to make comments regarding this document, please Contact Us. All comments are welcome. Implementation of certain elements of this Specification may require licenses under third party intellectual property rights, including without limitation, patent rights. The FIDO Alliance, Inc. and its Members and any other contributors to the Specification are not, and shall not be held, responsible in any manner for identifying or failing to identify any or all such third party intellectual property rights. THIS FIDO ALLIANCE SPECIFICATION IS PROVIDED “AS IS” AND WITHOUT ANY WARRANTY OF ANY KIND, INCLUDING, WITHOUT LIMITATION, ANY EXPRESS OR IMPLIED WARRANTY OF NON-INFRINGEMENT, MERCHANTABILITY OR FITNESS FOR A PARTICULAR PURPOSE. This document has been reviewed by FIDO Aliance Members and is endorsed as a Proposed Standard. It is a stable document and may be used as reference material or cited from another document. FIDO Alliance's role in making the Recommendation is to draw attention to the specification and to promote its widespread deployment. Type names, attribute names and element names are written as code. String literals are enclosed in “”, e.g. “UAF-TLV”. In formulas we use “|” to denote byte wise concatenation operations. The notation base64url refers to "Base 64 Encoding with URL and Filename Safe Alphabet" [ RFC4648 ] without padding. Following [ WebIDL-ED ], dictionary members are optional unless they are explicitly marked as required. WebIDL dictionary members MUST NOT have a value of null. Unless otherwise specified, if a WebIDL dictionary member is DOMString, it MUST NOT be empty. Unless otherwise specified, if a WebIDL dictionary member is a List, it MUST NOT be an empty list. UAF specific terminology used in this document is defined in [ FIDOGlossary ]. All diagrams, examples, notes in this specification are non-normative. Note: Certain dictionary members need to be present in order to comply with FIDO requirements. Such members are marked in the WebIDL definitions found in this document, as required. The keyword required has been introduced by [ WebIDL-ED ], which is a work-in-progress. If you are using a WebIDL parser which implements [ WebIDL ], then you may remove the keyword required from your WebIDL and use other means to ensure those fields are present. The key words “MUST”, “MUST NOT”, “REQUIRED”, “SHALL”, “SHALL NOT”, “SHOULD”, “SHOULD NOT”, “RECOMMENDED”, “MAY”, and “OPTIONAL” in this document are to be interpreted as described in [ RFC2119 ]. The goal of this Universal Authentication Framework is to provide a unified and extensible authentication mechanism that supplants passwords while avoiding the shortcomings of current alternative authentication approaches. The design goal of the protocol is to enable Relying Parties to leverage the diverse and heterogeneous set of security capabilities available on end users' devices via a single, unified protocol. 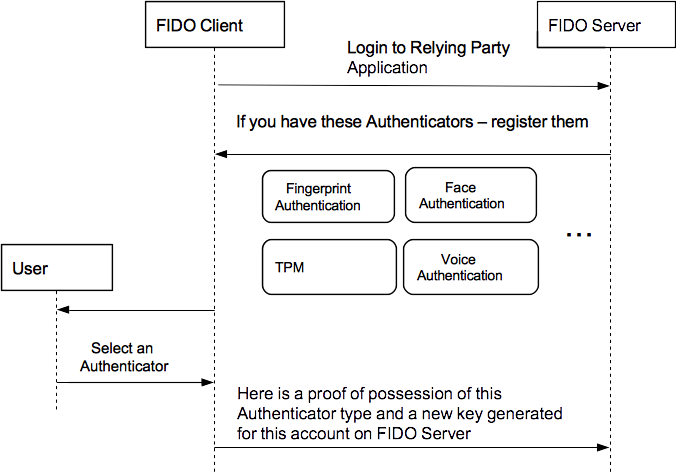 This approach is designed to allow the FIDO Relying Parties to choose the best available authentication mechanism for a particular end user or interaction, while preserving the option for a relying party to leverage emerging device security capabilities in the future, without requiring additional integration effort. This document describes FIDO architecture in detail and defines the UAF protocol as a network protocol. It defines the flow and content of all UAF messages and presents the rationale behind the design choices. What does an HTTP binding look like for UAF? How can a web application communicate to FIDO UAF Client? 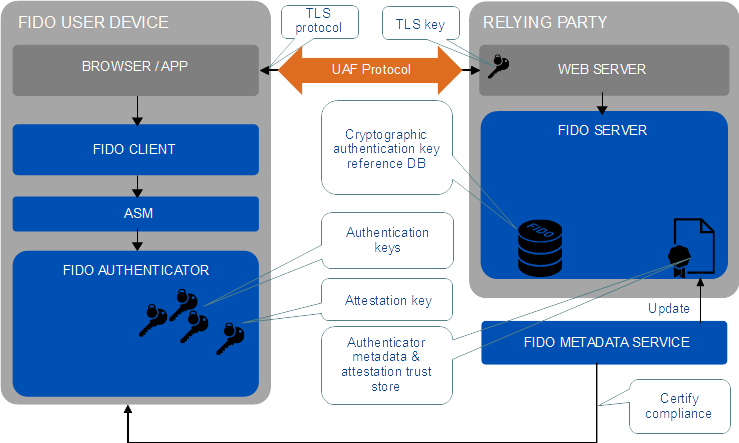 How can FIDO UAF Client communicate to FIDO enabled Authenticators? The answers to these questions can be found in other UAF specifications, e.g. [ UAFAppAPIAndTransport ] [ UAFASM ] [ UAFAuthnrCommands ]. The following diagram depicts the entities involved in UAF protocol. It is assumed in this document that a FIDO Server has access to the UAF Authenticator Metadata [ UAFAuthnrMetadata ] describing all the authenticators it will interact with. The core UAF protocol consists of four conceptual conversations between a FIDO UAF Client and FIDO Server. Registration: UAF allows the relying party to register a FIDO Authenticator with the user's account at the relying party. The relying party can specify a policy for supporting various FIDO Authenticator types. A FIDO UAF Client will only register existing authenticators in accordance with that policy. Authentication: UAF allows the relying party to prompt the end user to authenticate using a previously registered FIDO Authenticator. This authentication can be invoked any time, at the relying party's discretion. Transaction Confirmation: In addition to providing a general authentication prompt, UAF offers support for prompting the user to confirm a specific transaction. This prompt includes the ability to communicate additional information to the client for display to the end user, using the client's transaction confirmation display. The goal of this additional authentication operation is to enable relying parties to ensure that the user is confirming a specified set of the transaction details (instead of authenticating a session to the user agent). Deregistration: The relying party can trigger the deletion of the account-related authentication key material. Although this document defines the FIDO Server as the initiator of requests, in a real world deployment the first UAF operation will always follow a user agent's (e.g. HTTP) request to a relying party. The following sections give a brief overview of the protocol conversation for individual operations. More detailed descriptions can be found in the sections Registration Operation, Authentication Operation, and Deregistration Operation. The following diagram shows the message flows for registration. The client application should use the appropriate API to inform the FIDO UAF Client of the results of the operation (see section 2.3.1 in [ UAFAppAPIAndTransport ]) in order to allow the FIDO UAF Client to do some "housekeeping" tasks. The following diagram depicts the message flows for the authentication operation. The client application should use the appropriate API to inform the FIDO UAF Client of the results of the operation (see section 2.3.1 in [ UAFAppAPIAndTransport ]) in order to allow FIDO UAF Client to do some "housekeeping" tasks. The following figure depicts the transaction confirmation message flow. The following diagram depicts the deregistration message flow. This section provides a detailed description of operations supported by the UAF Protocol. Support of all protocol elements is mandatory for conforming software, unless stated otherwise. All string literals in this specification are constructed from Unicode codepoints within the set U+0000..U+007F. Unless otherwise specified, protocol messages are transferred with a UTF-8 content encoding. All data used in this protocol must be exchanged using a secure transport protocol (such as TLS/HTTPS) established between the FIDO UAF Client and the relying party in order to follow the assumptions made in [ FIDOSecRef ]; details are specified in section 4.1.6 TLS Protected Communication. The notation base64url(byte[8..64]) reads as 8-64 bytes of data encoded in base64url, "Base 64 Encoding with URL and Filename Safe Alphabet" [ RFC4648 ] without padding. The notation string reads as five unicode characters, represented as a UTF-8 [ RFC3629 ] encoded string of the type indicated in the declaration, typically a WebIDL [ WebIDL-ED ] DOMString. As the UTF-8 representation has variable length, the maximum byte length of string is string[4*5]. All strings are case-sensitive unless stated otherwise. This document uses WebIDL [ WebIDL-ED ]to define UAF protocol messages. Implementations MUST serialize the UAF protocol messages for transmission using UTF-8 encoded JSON [ RFC4627 ]. This section defines types and structures shared by various operations. Represents a generic version with major and minor fields. Major version, 1 for this specification. Minor version, 0 for this specification. Describes the operation type of a UAF message or request for a message. UAF protocol version. Major version MUST be 1 and minor version MUST be 0. Name of FIDO operation this message relates to. "Auth" is used for both authentication and transaction confirmation. The application identifier that the relying party would like to assert. If the element is missing or empty in the request, the FIDO UAF Client MUST set it to theFacetID of the caller. If the appID present in the message is identical to the FacetID of the caller, the FIDO UAF Client MUST accept it. If it is an URI with HTTPS protocol scheme, the FIDO UAF Client MUST use it to load the list of trusted facet identifiers from the specified URI. The FIDO UAF Client MUST only accept the request, if the facet identifier of the caller matches one of the trusted facet identifiers in the list returned from dereferencing this URI. The new key pair that the authenticator generates will be associated with this application identifier. A session identifier created by the relying party. The relying party can opaquely store things like expiration times for the registration session, protocol version used and other useful information in serverData. This data is opaque to FIDO UAF Clients. FIDO Servers may reject a response that is lacking this data or is containing unauthorized modifications to it. Servers that depend on the integrity of serverData should apply appropriate security measures, as described in Registration Request Generation Rules for FIDO Server and section ServerData and KeyHandle. List of UAF Message Extensions. Each authenticator MUST have an AAID to identify UAF enabled authenticator models globally. The AAID MUST uniquely identify a specific authenticator model within the range of all UAF-enabled authenticator models made by all authenticator vendors, where authenticators of a specific model must share identical security characteristics within the model (see Security Considerations). "V" indicates the authenticator Vendor Code. This code consists of 4 hexadecimal digits. "M" indicates the authenticator Model Code. This code consists of 4 hexadecimal digits. HEXDIG is case insensitive, i.e. "03EF" and "03ef" are identical. The FIDO Alliance is responsible for assigning authenticator vendor Codes. Authenticator vendors are responsible for assigning authenticator model codes to their authenticators. Authenticator vendors MUST assign unique AAIDs to authenticators with different security characteristics. Adding new firmware/software features, or changing the underlying hardware protection mechanisms will typically change the security characteristics of an authenticator and hence would require a new AAID to be used. Refer to ([ UAFAuthnrMetadata ]) for more details. KeyID is a unique identifier (within the scope of an AAID) used to refer to a specific UAuth.Key. It is generated by the authenticator and registered with a FIDO Server. The (AAID, KeyID ) tuple MUST uniquely identify an authenticator's registration for a relying party. Whenever a FIDO Server wants to provide specific information to a particular authenticator it MUST use the (AAID, KeyID) tuple. KeyID MUST be base64url encoded within the UAF message (see above). During step-up authentication and deregistration operations, the FIDO Server SHOULD provide the KeyID back to the authenticator for the latter to locate the appropriate user authentication key, and perform the necessary operation with it. Roaming authenticators which don't have internal storage for, and cannot rely on any ASM to store, generated key handles SHOULD provide the key handle as part of the AuthenticatorRegistrationAssertion.assertion.KeyID during the registration operation (see also section ServerData and KeyHandle) and get the key handle back from the FIDO Server during the step-up authentication (in the MatchCriteria dictionary which is part of the policy) or deregistration operations (see [ UAFAuthnrCommands ] for more details). The exact structure and content of a KeyID is specific to the authenticator implementation. ServerChallenge is a server-provided random challenge. Security Relevance: The challenge is used by the FIDO Server to verify whether an incoming response is new, or has already been processed. See section Replay Attack Protection for more details. The ServerChallenge SHOULD be mixed into the entropy pool of the authenticator. Security Relevance: The FIDO Server SHOULD provide a challenge containing strong cryptographic randomness whenever possible. See section Server Challenge and Random Numbers. The minimum challenge length of 8 bytes follows the requirement in [ SP800-63 ] and is equivalent to the 20 decimal digits as required in [ RFC6287 ]. The maximum length has been defined such that SHA-512 output can be used without truncation. The mixing of multiple sources of randomness is recommended to improve the quality of the random numbers generated by the authenticator, as described in [ RFC4086 ]. The value MUST be taken from the challenge field of the request (e.g. RegistrationRequest.challenge, AuthenticationRequest.challenge). The value is determined by the FIDO UAF Client and it depends on the calling application. See [ FIDOAppIDAndFacets ] for more details. Security Relevance: The facetID is determined by the FIDO UAF Client and verified against the list of trusted facets retrieved by dereferencing the appID of the calling application. Contains the TLS information to be sent by the FIDO Client to the FIDO Server, binding the TLS channel to the FIDO operation. ChannelBinding contains channel binding information [ RFC5056 ]. Security Relevance:The channel binding may be verified by the FIDO Server in order to detect and prevent MITM attacks. If data related to any of the channel binding methods, described here, is available to the FIDO UAF Client (i.e. included in this dictionary), it MUST be used according to the relevant specification . All channel binding methods described here MUST be supported by the FIDO Server. The FIDO Server MAY reject operations if the channel binding cannot be verified successfully. If channel binding data is accessible to the web browser or client application, it must be relayed to the FIDO UAF Client in order to follow the assumptions made in [ FIDOSecRef ]. If channel binding data is accessible to the web server, it must be relayed to the FIDO Server in order to follow the assumptions made in [ FIDOSecRef ]. The FIDO Server relies on the web server to provide accurate channel binding information. This field MUST be absent if the TLS server certificate is not available to the processing entity (e.g., the FIDO UAF Client) or the hash function cannot be determined as described. This field MUST be absent if the TLS server certificate is not available to the FIDO UAF Client. This field MUST be set to the base64url-encoded, DER-encoded TLS server certificate, if this data is available to the FIDO UAF Client. MUST be set to the base64url-encoded TLS channel Finished structure. It MUST, however, be absent, if this data is not available to the FIDO UAF Client [ RFC5929 ]. MUST be absent if the client TLS stack doesn't provide TLS ChannelID [ ChannelID ] information to the processing entity (e.g., the web browser or client application). MUST be set to "unused" if TLS ChannelID information is supported by the client-side TLS stack but has not been signaled by the TLS (web) server. Otherwise, it MUST be set to the base64url-encoded serialized [ RFC4627 ] JwkKey structure using UTF-8 encoding. JwkKey is a dictionary representing a JSON Web Key encoding of an elliptic curve public key [ JWK ]. This public key is the ChannelID public key minted by the client TLS stack for the particular relying party. [ ChannelID ] stipulates using only a particular elliptic curve, and the particular coordinate type. kty of type required DOMString, defaulting to "EC"
Denotes the key type used for Channel ID. At this time only elliptic curve is supported by [ ChannelID ], so it MUST be set to "EC" [ JWA ]. crv of type required DOMString, defaulting to "P-256"
Denotes the elliptic curve on which this public key is defined. At this time only the NIST curve secp256r1 is supported by [ ChannelID ], so the crv parameter MUST be set to "P-256". Contains the base64url-encoding of the x coordinate of the public key (big-endian, 32-byte value). Contains the base64url-encoding of the y coordinate of the public key (big-endian, 32-byte value). FIDO extensions can appear in several places, including the UAF protocol messages, authenticator commands, or in the assertion signed by the authenticator. Each extension has an identifier, and the namespace for extension identifiers is FIDO UAF global (i.e. doesn't depend on the message where the extension is present). Extensions can be defined in a way such that a processing entity which doesn't understand the meaning of a specific extension MUST abort processing, or they can be specified in a way that unknown extension can (safely) be ignored. Extension processing rules are defined in each section where extensions are allowed. Generic extensions used in various operations. Contains arbitrary data with a semantics agreed between server and client. The data is base64url-encoded. This field MAY be empty. Indicates whether unknown extensions must be ignored (false) or must lead to an error (true). A value of true indicates that unknown extensions MUST result in an error. The FIDO UAF Client might (a) process an extension or (b) pass the extension through to the ASM. Unknown extensions must be passed through. The ASM might (a) process an extension or (b) pass the extension through to the FIDO authenticator. Unknown extensions must be passed through. The FIDO authenticator must handle the extension or ignore it (only if it doesn't know how to handle it and fail_if_unknown is not set). If the FIDO authenticator doesn't understand the meaning of the extension and fail_if_unknown is set, it must generate an error (see definition of fail_if_unknown above). When passing through an extension to the next entity, the fail_if_unknown flag must be preserved (see [ UAFASM ] [ UAFAuthnrCommands ]). FIDO protocol messages are not signed. If the security depends on an extension being known or processed, then such extension should be accompanied by a related (and signed) extension in the authenticator assertion (e.g. TAG_UAFV1_REG_ASSERTION, TAG_UAFV1_AUTH_ASSERTION). If the security has been increased (e.g. the FIDO authenticator according to the description in the metadata statement accepts multiple fingers but in this specific case indicates that the finger used at registration was also used for authentication) there is no need to mark the extension as fail_if_unknown (i.e. tag 0x3E12 should be used [ UAFAuthnrCommands ]). If the security has been degraded (e.g. the FIDO authenticator according to the description in the metadata statement accepts only the finger used at registration for authentication but in this specific case indicates that a different finger was used for authentication) the extension must be marked as fail_if_unknown (i.e. tag 0x3E11 must be used [ UAFAuthnrCommands ]). Represents the matching criteria to be used in the server policy. The MatchCriteria object is considered to match an authenticator, if all fields in the object are considered to match (as indicated in the particular fields). List of AAIDs, causing matching to be restricted to certain AAIDs. The match succeeds if at least one AAID entry in this array matches AuthenticatorInfo.aaid [ UAFASM ]. This field corresponds to MetadataStatement.aaid [ UAFAuthnrMetadata ]. The vendorID causing matching to be restricted to authenticator models of the given vendor. The first 4 characters of the AAID are the vendorID (see AAID)). The match succeeds if at least one entry in this array matches the first 4 characters of the AuthenticatorInfo.aaid [ UAFASM ]. This field corresponds to the first 4 characters ofMetadataStatement.aaid [ UAFAuthnrMetadata ]. A list of authenticator KeyIDs causing matching to be restricted to a given set of KeyID instances. (see [ UAFRegistry ]). This match succeeds if at least one entry in this array matches. This field corresponds to AppRegistration.keyIDs [ UAFASM ]. A set of 32 bit flags which may be set if matching should be restricted by the user verification method (see [ UAFRegistry ]). if one or more entries MetadataStatement.userVerificationDetails[i] contain multiple entries, then: stop, direct derivation is not possible. Must generate MatchCriteria object by providing a list of matching AAIDs. if all entries MetadataStatement.userVerificationDetails[i] only contain a single entry, then: combine all entries MetadataStatement.userVerificationDetails.userVerification to MetadataStatement.userVerificationDetails[N-1].userVerification into a single value using a bitwise OR operation. if MetadataStatement.userVerificationDetails contains a single entry, then: combine all entries MetadataStatement.userVerificationDetails.userVerification to MetadataStatement.userVerificationDetails[N-1].userVerification into a single value using a bitwise OR operation and additionally set the flag USER_VERIFY_ALL. This method doesn't allow matching authenticators implementing complex combinations of user verification methods, such as PIN AND (Fingerprint OR Speaker Recognition) (see above derivation rules). If such specific match rules are required, they need to be specified by providing the AAIDs of the matching authenticators. A set of 16 bit flags which may be set if matching should be restricted by the key protections used (see [ UAFRegistry ]). This match succeeds, if at least one of the bit flags matches the value of AuthenticatorInfo.keyProtection [ UAFASM ]. This field corresponds to MetadataStatement.keyProtection [ UAFAuthnrMetadata ]. A set of 16 bit flags which may be set if matching should be restricted by the matcher protection (see [ UAFRegistry ]). The match succeeds if at least one of the bit flags matches the value of AuthenticatorInfo.matcherProtection [ UAFASM ]. This field corresponds to the MetadataStatement.matcherProtection metadata statement. See [ UAFAuthnrMetadata ]. A set of 32 bit flags which may be set if matching should be restricted by the authenticator attachment mechanism (see [ UAFRegistry ]). This field is considered to match, if at least one of the bit flags matches the value of AuthenticatorInfo.attachmentHint [ UAFASM ]. This field corresponds to the MetadataStatement.attachmentHint metadata statement. A set of 16 bit flags which may be set if matching should be restricted by the transaction confirmation display availability and type. (see [ UAFRegistry ]). This match succeeds if at least one of the bit flags matches the value of AuthenticatorInfo.tcDisplay [ UAFASM ]. This field corresponds to the MetadataStatement.tcDisplay metadata statement. See [ UAFAuthnrMetadata ]. An array containing values of supported authentication algorithm TAG values (see [ UAFRegistry ], prefix UAF_ALG_SIGN) if matching should be restricted by the supported authentication algorithms. This match succeeds if at least one entry in this array matches the AuthenticatorInfo.authenticationAlgorithm [ UAFASM ]. This field corresponds to the MetadataStatement.authenticationAlgorithm metadata statement. See [ UAFAuthnrMetadata ]. A list of supported assertion schemes if matching should be restricted by the supported schemes. See section UAF Supported Assertion Schemes for details. This match succeeds if at least one entry in this array matches AuthenticatorInfo.assertionScheme [ UAFASM ]. This field corresponds to the MetadataStatement.assertionScheme metadata statement. See [ UAFAuthnrMetadata ]. An array containing the preferred attestation TAG values (see [ UAFRegistry ], prefix TAG_ATTESTATION). The order of items MUST be preserved. The most-preferred attestation type comes first. This match succeeds if at least one entry in this array matches one entry in AuthenticatorInfo.attestationTypes [ UAFASM ]. This field corresponds to the MetadataStatement.attestationTypes metadata statement. See [ UAFAuthnrMetadata ]. Contains an authenticator version number, if matching should be restricted by the authenticator version in use. This match succeeds if the value is lower or equal to the field AuthenticatorVersion included in TAG_UAFV1_REG_ASSERTION or TAG_UAFV1_AUTH_ASSERTION or a corresponding value in the case of a different assertion scheme. Since the semantic of the authenticatorVersion depends on the AAID, the field authenticatorVersion should always be combined with a single aaid in MatchCriteria. This field corresponds to the MetadataStatement.authenticatorVersion metadata statement. See [ UAFAuthnrMetadata ]. Contains a specification of accepted authenticators and a specification of disallowed authenticators. This field is a two-dimensional array describing the required authenticator characteristics for the server to accept either a FIDO registration, or authentication operation for a particular purpose. This two-dimensional array can be seen as a list of sets. List elements (i.e. the sets) are alternatives (OR condition). The first array index indicates OR conditions (i.e. the list). Any set of authenticator(s) satisfying these MatchCriteria in the first index is acceptable to the server for this operation. Sub-arrays of MatchCriteria in the second index (i.e. the set) indicate that multiple authenticators (i.e. each set element) MUST be registered or authenticated to be accepted by the server. The MatchCriteria array represents ordered preferences by the server. Servers MUST put their preferred authenticators first, and FIDO UAF Clients SHOULD respect those preferences, either by presenting authenticator options to the user in the same order, or by offering to perform the operation using only the highest-preference authenticator(s). Any authenticator that matches any of MatchCriteria contained in the field disallowed MUST be excluded from eligibility for the operation, regardless of whether it matches any MatchCriteria present in the accepted list, or not. Policy.accepted is a list of combinations. Each combination indicates a list of criteria for authenticators that the server wants the user to register. Follow the priority of items in Policy.accepted. The lists are ordered with highest priority first. Example 2: Policy matching authenticators implementing FPS and Face Recognition as alternative combination of user verification methods. Combining these two bit-flags and the flag USER_VERIFY_ALL (USER_VERIFY_ALL = 1024) into a single userVerification value would match authenticators implementing FPS and Face Recognition as a mandatory combination of user verification methods. Example 3: Policy matching authenticators implementing FPS and Face Recognition as mandatory combination of user verification methods. The UAF protocol includes multiple versioned constructs: UAF protocol version, the version of Key Registration Data and Signed Data objects (identified by their respective tags, see [ UAFRegistry ]), and the ASM version, see [ UAFASM ]. The Key Registration Data and Signed Data objects have to be parsed and verified by the FIDO Server. This verification is only possible if the FIDO Server understands their encoding and the content. Each UAF protocol version supports a set of Key Registration Data and SignedData object versions (called Assertion Schemes). Similarly each of the ASM versions supports a set Assertion Scheme versions. As a consequence the FIDO UAF Client MUST select the authenticators which will generate the appropriately versioned constructs. Intersect FC_Version_Set with the set of upv included in UAF Message (i.e. keep only those pairs where the upv value is also contained in the UAF Message). Construct a set (Authnr_Version_Set) of version pairs including authenticator supported asm_version and the compatible upv(s). Intersect Authnr_Version_Set with FC_Version_Set and select highest version pair from it. Take the pair where the upv is highest. In all these pairs leave only the one with highest asm_version. Each version consists of major and minor fields. In order to compare two versions - compare the Major fields and if they are equal compare the Minor fields. Each UAF message contains a version field upv. UAF Protocol version negotiation is always between FIDO UAF Client and FIDO Server. The Registration operation allows the FIDO Server and the FIDO Authenticator to agree on an authentication key. The following diagram depicts the cryptographic data flow for the registration sequence. The FIDO Server sends the AppID (see section AppID and FacetID Assertion), the authenticator Policy, the ServerChallenge and the Username to the FIDO UAF Client. The FIDO UAF Client computes the FinalChallengeParams (FCH) from the ServerChallenge and some other values and sends the AppID, the FCH and the Username to the authenticator. The authenticator creates a Key Registration Data object (e.g. TAG_UAFV1_KRD, see [ UAFAuthnrCommands ]) containing the hash of FCH, the newly generated user public key (UAuth.pub) and some other values and signs it (see section Authenticator Attestation for more details). This KRD object is then cryptographically verified by the FIDO Server. UAF Registration request message is represented as an array of dictionaries. Each dictionary contains an registration request for a specific protocol version. The array MUST NOT contain two dictionaries of the same protocol version. For version "1.0" the request is defined as RegistrationRequest dictionary. RegistrationRequest contains a single, versioned, registration request. Operation header. Header.op MUST be "Reg"
The name of the Assertion Scheme used to encode the assertion. See UAF Supported Assertion Schemes for details. This assertionScheme is not part of a signed object and hence considered the suspected assertionScheme. base64url(byte[1..4096]) Contains the TAG_UAFV1_REG_ASSERTION object containing the assertion scheme specific KeyRegistrationData (KRD) object which in turn contains the newly generated UAuth.pub and is signed by the Attestation Private Key. This assertion MUST be generated by the authenticator and it MUST be used only in this Registration operation. The format of this assertion can vary from one assertion scheme to another (e.g. for "UAFV1TLV" assertion scheme it MUST be TAG_UAFV1_KRD). Supported transaction PNG type [ UAFAuthnrMetadata ]. For the definition of the DisplayPNGCharacteristicsDescriptor structure See [ UAFAuthnrMetadata ]. A UAF Registration response message is represented as an array of dictionaries. Each dictionary contains a registration response for a specific protocol version. The array MUST NOT contain two dictionaries of the same protocol version. For version "1.0" the response is defined as RegistrationResponse dictionary. Line breaks in fcParams have been inserted for improving readability. Contains all fields related to the registration response. The base64url-encoded serialized [ RFC4627 ] FinalChallengeParams using UTF8 encoding (see FinalChallengeParams dictionary) which contains all parameters required for the server to verify the Final Challenge. Response data for each Authenticator being registered. The policy contains a two-dimensional array of allowed MatchCriteria (see Policy). This array can be considered a list (first dimension) of sets (second dimension) of authenticators (identified by MatchCriteria). All authenticators in a specific set MUST be registered simultaneously in order to match the policy. But any of those sets in the list are valid, as the list elements are alternatives. Create an array of MatchCriteria objects, containing the set of authenticators to be registered simultaneously that need to be identified by separate MatchCriteria objects m.
m.aaid MAY be combined with (one or more of) m.keyIDs, m.attachmentHint, m.authenticatorVersion, and m.exts, but m.aaid MUST NOT be combined with any other match criteria field. Add m to v, e.g. v[j+1]=m. Create MatchCriteria objects m for all disallowed Authenticators. Create a MatchCriteria object m and add AAID and corresponding KeyIDs to m.aaid and m.KeyIDs. The FIDO Server MUST include already registered AAIDs and KeyIDs into field p.disallowed to hint that the client should not register these again. Create a MatchCriteria object m and add the AAIDs of all disallowed Authenticators to m.aaid. The status (as provided in the metadata TOC (Table-of-Contents file) [ UAFMetadataService ]) of some authenticators might be unacceptable. Such authenticators SHOULD be included in p.disallowed. Add all m to p.disallowed. FIDO Servers SHOULD NOT assume any implicit integrity protection of r.header.serverData. FIDO Servers that depend on the integrity of r.header.serverData SHOULD apply and verify a cryptographically secure Message Authentication Code (MAC) to serverData and they SHOULD also cryptographically bind serverData to the related message, e.g. by re-including r.challenge, see also section ServerData and KeyHandle. All other FIDO components (except the FIDO server) will treat r.header.serverData as an opaque value. As a consequence the FIDO server can implement any suitable cryptographic protection method. Obtain FacetID of the requesting Application. If the AppID is missing or empty, set the AppID to the FacetID. Verify that the FacetID is authorized for the AppID according to the algorithms in [ FIDOAppIDAndFacets ]. Create a FinalChallengeParams structure fcp and set fcp.appID, fcp.challenge, fcp.facetID, and fcp.channelBinding appropriately. Serialize [ RFC4627 ] fcp using UTF8 encoding and base64url encode it. Add AppID, Username, FinalChallenge, AttestationType and all other required fields to the ASMRequest [ UAFASM ]. The FIDO UAF Client MUST follow the server policy and find the single preferred attestation type. A single attestation type MUST be provided to the ASM. See [ UAFAuthnrCommands ], section "Register Command". The following processing rules assume that Authenticator supports "UAFV1TLV" assertion scheme. Currently "UAFV1TLV" is the only defined and supported assertion scheme. When a new assertion scheme is added to UAF protocol - this section will be extended with corresponding processing rules. Verify that RegistrationResponse.header.serverData, if used, passes any implementation-specific checks against its validity. See also section ServerData and KeyHandle. Parse TLV data from a.assertion assuming it is encoded according to the suspected assertion scheme a.assertionScheme and make sure it contains all mandatory fields (indicated in Authenticator Metadata) it is supposed to have and has a valid syntax. Retrieve the AAID from the assertion. The AAID in TAG_UAFV1_KRD is contained in a.assertion.TAG_UAFV1_REG_ASSERTION.TAG_UAFV1_KRD.TAG_AAID. Verify that the AAID indeed matches the policy specified in the registration request. Depending on the policy (e.g. in the case of AND combinations), it might be required to evaluate other assertions included in this RegistrationResponse in order to determine whether this AAID matches the policy. Locate authenticator-specific authentication algorithms from the authenticator metadata [ UAFAuthnrMetadata ] using the AAID. Hash RegistrationResponse.fcParams using hashing algorithm suitable for this authenticator type. Look up the hash algorithm in authenticator metadata, field AuthenticationAlgs. It is the hash algorithm associated with the first entry related to a constant with prefix UAF_ALG_SIGN. Obtain Metadata(AAID).AttestationType for the AAID and make sure that a.assertion.TAG_UAFV1_REG_ASSERTION contains the most preferred attestation tag specified in field MatchCriteria.attestationTypes in RegistrationRequest.policy (if this field is present). Obtain Metadata(AAID).AuthenticatorVersion for the AAID and make sure that it is lower or equal to a.assertion.TAG_UAFV1_REG_ASSERTION.TAG_UAFV1_KRD.AuthenticatorVersion. If Metadata(AAID).AuthenticatorVersion is higher (i.e. the authenticator firmware is outdated), it is RECOMMENDED to assume increased risk. See sections "StatusReport dictionary" and "Metadata TOC object Processing Rules" in [ UAFMetadataService ] for more details on this. Obtain contents of all TAG_ATTESTATION_CERT tags from a.assertion.TAG_UAFV1_REG_ASSERTION.TAG_ATTESTATION_BASIC_FULL object. The occurrences are ordered (see [ UAFAuthnrCommands ]) and represent the attestation certificate followed by the related certificate chain. Obtain all entries of AttestationRootCertificates for the AAID in authenticator Metadata, field AttestationRootCertificates. Verify a.assertion.TAG_UAFV1_REG_ASSERTION.TAG_UAFV1_KRD.TAG_ATTESTATION_BASIC_FULL.Signature using the attestation certificate (obtained before). There is no real attestation for the AAID, so we just assume the AAID is the real one. 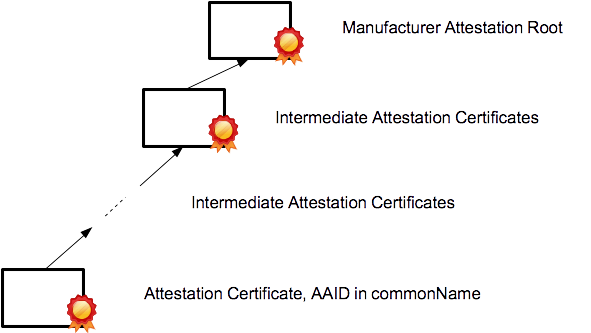 If entry AttestationRootCertificates for the AAID in the metadata is not empty - continue with next assertion (as the AAID obviously is expecting a different attestation method). If a.assertion.TAG_UAFV1_REG_ASSERTION.TAG_UAFV1_KRD contains another TAG_ATTESTATION tag - verify the attestation by following appropriate processing rules applicable to that attestation. Currently this document only defines the processing rules for Basic Attestation. if a.assertion.TAG_UAFV1_REG_ASSERTION contains a different object than TAG_UAFV1_KRD as first element, then follow the rules specific to that object. Extract a.assertion.TAG_UAFV1_REG_ASSERTION.TAG_UAFV1_KRD.PublicKey into PublicKey, a.assertion.TAG_UAFV1_REG_ASSERTION.TAG_UAFV1_KRD.KeyID into KeyID, a.assertion.TAG_UAFV1_REG_ASSERTION.TAG_UAFV1_KRD.SignCounter into SignCounter, a.assertion.TAG_UAFV1_REG_ASSERTION.TAG_UAFV1_KRD.TAG_ASSERTION_INFO.authenticatorVersion into AuthenticatorVersion, a.assertion.TAG_UAFV1_REG_ASSERTION.TAG_UAFV1_KRD.TAG_AAID into AAID. if a.assertion doesn't contain an object of type TAG_UAFV1_REG_ASSERTION, then skip this assertion (as in this UAF v1 only TAG_UAFV1_REG_ASSERTION is defined). Store PublicKey, KeyID, SignCounter, AuthenticatorVersion, AAID and a.tcDisplayPNGCharacteristics into a record associated with the user's identity . If an entry with the same pair of AAID and KeyID already exists then fail (should never occur). During this operation, the FIDO Server asks the FIDO UAF Client to authenticate user with server-specified authenticators, and return an authentication response. In order for this operation to succeed, the authenticator and the relying party must have a previously shared registration. The FIDO Server sends the AppID (see [ FIDOAppIDAndFacets ]), the authenticator policy and the ServerChallenge to the FIDO UAF Client. The FIDO UAF Client computes the hash of the FinalChallengeParams, produced from the ServerChallenge and other values, as described in this document, and sends the AppID and hashed FinalChallengeParams to the Authenticator. The authenticator creates the SignedData object (see TAG_UAFV1_SIGNED_DATA in [ UAFAuthnrCommands ]) containing the hash of the final challenge parameters, and some other values and signs it using the UAuth.priv key. This assertion is then cryptographically verified by the FIDO Server. Contains the MIME Content-Type supported by the authenticator according its metadata statement (see [ UAFAuthnrMetadata ]). This version of the specification only supports the values text/plain or image/png. Contains the base64-url encoded transaction content according to the contentType to be shown to the user. If contentType is "text/plain" then the content MUST be the base64-url encoding of the ASCII encoded text with a maximum of 200 characters. Transaction content PNG characteristics. For the definition of the DisplayPNGCharacteristicsDescriptor structure See [ UAFAuthnrMetadata ]. This field MUST be present if the contentType is "image/png". UAF Authentication request message is represented as an array of dictionaries. Each dictionary contains an authentication request for a specific protocol version. The array MUST NOT contain two dictionaries of the same protocol version. For version "1.0" the request is defined as AuthenticationRequest dictionary. Transaction data to be explicitly confirmed by the user. The list contains the same transaction content in various content types and various image sizes. Refer to [ UAFAuthnrMetadata ] for more information about Transaction Confirmation Display characteristics. Server-provided policy defining what types of authenticators are acceptable for this authentication operation. The name of the Assertion Scheme used to encode assertion. See	UAF Supported Assertion Schemes for details. base64url(byte[1..4096]) Contains the assertion containing a signature generated by UAuth.priv, i.e. TAG_UAFV1_AUTH_ASSERTION. Represents the response to a challenge, including the set of signed assertions from registered authenticators. The field fcParams is the base64url-encoded serialized [ RFC4627 ] FinalChallengeParams in UTF8 encoding (see FinalChallengeParams dictionary) which contains all parameters required for the server to verify the Final Challenge. The list of authenticator responses related to this operation. UAF Authentication response message is represented as an array of dictionaries. Each dictionary contains an authentication response for a specific protocol version. The array MUST NOT contain two dictionaries of the same protocol version. For version "1.0" the response is defined as AuthenticationResponse dictionary. The policy contains a 2-dimensional array of allowed MatchCriteria (see Policy). This array can be considered a list (first dimension) of sets (second dimension) of authenticators (identified by MatchCriteria). All authenticators in a specific set MUST be used for authentication simultaneously in order to match the policy. But any of those sets in the list are valid, i.e. the list elements are alternatives. Create an 1-dimensional array of MatchCriteria objects v containing the set of authenticators to be used for authentication simultaneously that need to be identified by separate MatchCriteria objects m.
In case of step-up authentication (i.e. in the case where it is expected the user is already known due to a previous authentication step) every item in Policy.accepted MUST include the AAID and KeyID of the authenticator registered for this account in order to avoid ambiguities when having multiple accounts at this relying party. Create a MatchCriteria object m and add AAIDs of all disallowed authenticators to m.aaid. The status (as provided in the metadata TOC [ UAFMetadataService ]) of some authenticators might be unacceptable. Such authenticators SHOULD be included in p.disallowed. FIDO Servers SHOULD NOT assume any implicit integrity protection of r.header.serverData. FIDO Servers that depend on the integrity of r.header.serverData SHOULD apply and verify a cryptographically secure Message Authentication Code (MAC) to serverData and they SHOULD also cryptographically bind serverData to the related message, e.g. by re-including r.challenge, see also section ServerData and KeyHandle. If this is a transaction confirmation operation - look up TransactionConfirmationDisplayContentTypes/ TransactionConfirmationDisplayPNGCharacteristics from authenticator metadata of every participating AAID, generate a list of corresponding transaction content and insert the list into r.transaction. If the authenticator reported (a dynamic) AuthenticatorRegistrationAssertion.tcDisplayPNGCharacteristics during Registration - it MUST be preferred over the (static) value specified in the authenticator Metadata. Set r.policy to our new policy object p created above, e.g. r.policy = p.
Filter available authenticators with the given policy and present the filtered list to User. Let the user select the preferred Authenticator. Add AppID, FinalChallenge, Transactions (if present), and all other fields to the ASMRequest. Send the ASMRequest to the ASM. See [ UAFAuthnrCommands ], section "Sign Command". Verify that AuthenticationResponse.header.serverData, if used, passes any implementation-specific checks against its validity. See also section ServerData and KeyHandle. The AAID in TAG_UAFV1_SIGNED_DATA is contained in a.assertion.TAG_UAFV1_AUTH_ASSERTION.TAG_UAFV1_SIGNED_DATA.TAG_AAID. Obtain Metadata(AAID).AuthenticatorVersion for this AAID and make sure that it is lower or equal to a.assertion.TAG_UAFV1_AUTH_ASSERTION.TAG_UAFV1_SIGNED_DATA.TAG_ASSERTION_INFO.AuthenticatorVersion. If Metadata(AAID).AuthenticatorVersion is higher (i.e. the authenticator firmware is outdated), it is RECOMMENDED to assume increased authentication risk. See "StatusReport dictionary" and "Metadata TOC object Processing Rules" in [ UAFMetadataService ] for more details on this. Locate UAuth.pub public key associated with (AAID, KeyID) in the user's record. Verify the AAID against the AAID stored in the user's record at time of Registration. If it is greater than 0, but didn't increment - continue with next assertion (as this is a cloned authenticator or a cloned authenticator has been used previously). Hash AuthenticationResponse.FinalChallengeParams using the hashing algorithm suitable for this authenticator type. Look up the hash algorithm in authenticator Metadata, field AuthenticationAlgs. It is the hash algorithm associated with the first entry related to a constant with prefix UAF_ALG_SIGN. The transaction hash included in this AuthenticationResponse must match the transaction content specified in the related AuthenticationRequest. As FIDO doesn’t mandate any specific FIDO Server API, the transaction content could be cached by any relying party software component, e.g. the FIDO Server or the relying party Web Application. Make sure there is a transaction cached on Relying Party side. Go over all cached forms of the transaction content (potentially multiple cached PNGs for the same transaction) and calculate their hashes using hashing algorithm suitable for this authenticator (same hash algorithm as used for FinalChallenge). if a.assertion.TAG_UAFV1_AUTH_ASSERTION contains a different object than TAG_UAFV1_SIGNED_DATA as first element, then follow the rules specific to that object. if a.assertion doesn't contain an object of type TAG_UAFV1_AUTH_ASSERTION, then skip this assertion (as in this UAF v1 only TAG_UAFV1_AUTH_ASSERTION is defined). Treat this assertion a as positively verified. Process all positively verified authentication assertions a. This operation allows FIDO Server to ask the FIDO Authenticator to delete keys related to the particular relying party. The Along with other cases FIDO Server should also trigger this operation when the user removes his account at the relying party. The FIDO UAF Deregistration request message is represented as an array of dictionaries. Each dictionary contains a deregistration request for a specific protocol version. The array MUST NOT contain two dictionaries of the same protocol version. For version "1.0" the request is defined as DeregistrationRequest dictionary. There is no deregistration response object. AAID of the authenticator to deregister. The unique KeyID related to UAuth.priv. KeyID is assumed to be unique within the scope of an AAID only. List of authenticators to be deregistered. See [ UAFASM ] section "Deregister request". This section describes the important design elements used in the protocol. Authentication Factor, Installation type, supported content-types and other supplementary information, etc. In order to make a decision about which authenticators are appropriate for a specific transaction, FIDO Server looks up the list of authenticator metadata by AAID and retrieves the required information from it. Each entry in the authenticator metadata repository MUST be identified with a unique authenticator Attestation ID (AAID). Authenticator Attestation is the process of validating authenticator model identity during registration. It allows Relying Parties to cryptographically verify that the authenticator reported by FIDO UAF Client is really what it claims to be. Using authenticator Attestation, a relying party "example-rp.com" will be able to verify that the authenticator model of the "example-Authenticator", reported with AAID "1234#5678", is not malware running on the FIDO User Device but is really a authenticator of model "1234#5678". FIDO Authenticators SHOULD support "Basic Attestation" described below. New Attestation mechanisms may be added to the protocol over time. FIDO Authenticators not providing sufficient protection for Attestation keys (non-attested authenticators) MUST use the UAuth.priv key in order to formally generate the same KeyRegistrationData object as attested authenticators. This behavior MUST be properly declared in the Authenticator Metadata. Based on an attestation private key shared among a class of authenticators (e.g. same model). Just syntactically a Basic Attestation. The attestation object self-signed, i.e. it is signed using the UAuth.priv key, i.e. the key corresponding to the UAuth.pub key included in the attestation object. As a consequence it does not provide a cryptographic proof of the security characteristics. But it is the best thing we can do if the authenticator is not able to have an attestation private key. FIDO Servers must have access to a trust anchor for verifying attestation public keys (i.e. Attestation Certificate trust store) in order to follow the assumptions made in [ FIDOSecRef ]. Authenticators must provide its attestation signature during the registration process for the same reason. The attestation trust anchor is shared with FIDO Servers out of band (as part of the Metadata). This sharing process shouldt be done according to [ UAFMetadataService ]. The protection measures of the Authenticator's attestation private key depend on the specific authenticator model's implementation. The FIDO Server must load the appropriate Authenticator Attestation Root Certificate from its trust store based on the AAID provided in KeyRegistrationData object. In this Full Basic Attestation model, a large number of authenticators must share the same Attestation certificate and Attestation Private Key in order to provide non-linkability (see Protocol Core Design Considerations). Authenticators can only be identified on a production batch level or an AAID level by their Attestation Certificate, and not individually. A large number of authenticators sharing the same Attestation Certificate provides better privacy, but also makes the related private key a more attractive attack target. A given set of authenticators sharing the same manufacturer and essential characteristics must not be issued a new Attestation Key before at least 100,000 devices are issued the previous shared key. In this attestation method, the UAuth.priv key MUST be used to sign the Registration Data object. This behavior MUST be properly declared in the Authenticator Metadata. FIDO Authenticators not providing sufficient protection for Attestation keys (non-attested authenticators) must use this attestation method. FIDO Servers must inform the calling Relying Party Web Application Server (see FIDO Interoperability Overview) about any error conditions encountered when generating or processing UAF messages through their proprietary API. FIDO Authenticators MUST inform the FIDO UAF Client (see FIDO Interoperability Overview) about any error conditions encountered when processing commands through the Authenticator Specific Module (ASM). See [ UAFASM ] and [ UAFAuthnrCommands ] for details. UAF Protocol is designed to be compatible with a variety of existing authenticators (TPMs, Fingerprint Sensors, Secure Elements, etc.) and also future authenticators designed for FIDO. Therefore extensibility is a core capability designed into the protocol. The combination of KeyRegistrationData and SignedData schemes is called an Assertion Scheme. The UAF protocol allows plugging in new Assertion Schemes. See also UAF Supported Assertion Schemes. The Registration Assertion defines how and in which format a cryptographic key is exchanged between the authenticator and the FIDO Server. The Authentication Assertion defines how and in which format the authenticator generates a cryptographic signature. The generally-supported Assertion Schemes are defined in [ UAFRegistry ]. 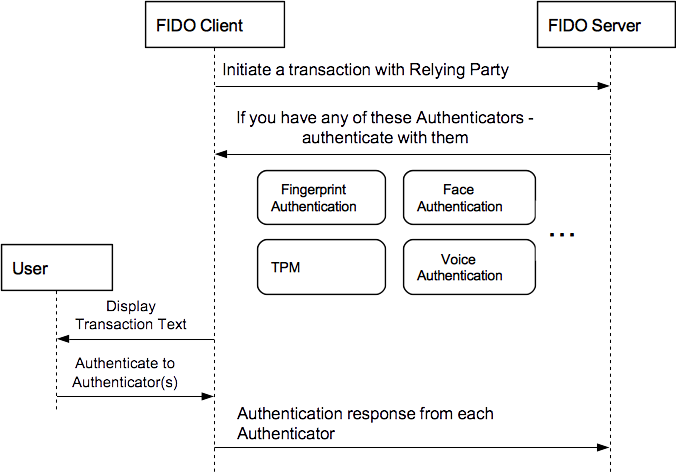 FIDO UAF supports authenticators acting as first authentication factor (i.e. replacing username and password). In this case the authenticator stores the username (uniquely identifying an account at the specific relying party) internally. See [ UAFAuthnrCommands ], section "Sign Command" for details. In order to protect the data communication between FIDO UAF Client and FIDO Server a protected TLS channel must be used by FIDO UAF Client (or User Agent) and the Relying Party for all protocol elements. TLS Client and Server should use TLS v1.2 or newer and should only use TLS v1.1 if TLS v1.2 or higher are not available. The "anon" and "null" TLS crypto suites are not allowed and must be rejected; insecure crypto-algorithms in TLS (e.g. MD5, RC4, SHA1) should be avoided [[SP 800-131A]]. TLS Client verifies and validates the server certificate chain according to [ RFC5280 ], section 6 "Certificate Path Validation". The certificate revocation status should be checked (e.g. using OCSP [ RFC2560 ] or CRL based validation [ RFC5280 ]) and the TLS server identity should be checked as well [ RFC6125 ]. TLS Client's trusted certificate root store is properly maintained and at least requires the CAs included in the root store to annually pass Web Trust or ETSI (ETSI TS 101 456, or ETSI TS 102 042) audits for SSL CAs. See [ TR-03116-4 ] and [ SHEFFER-TLS ] for more recommendations on how to use TLS. A ServerChallenge needs appropriate random sources in order to be effective (see [ RFC4086 ] for more details). The (pseudo-)random numbers used for generating the Server Challenge should successfully pass the randomness test specified in [ Coron99 ] and they should follow the guideline given in [ SP800-90b ]. There is no "one size fits all" authentication method. The FIDO goal is to decouple the user verification method from the authentication protocol and the authentication server, and to support a broad range of user verification methods and a broad range of assurance levels. FIDO authenticators should be able to leverage capabilities of existing computing hardware, e.g. mobile devices or smart cards. The overall assurance level of electronic user authentications highly depends (a) on the security and integrity of the user's equipment involved and (b) on the authentication method being used to authenticate the user. When using FIDO, users should have the freedom to use any available equipment and a variety of authentication methods. The relying party needs reliable information about the security relevant parts of the equipment and the authentication method itself in order to determine whether the overall risk of an electronic authentication is acceptable in a particular business context. The FIDO Metadata[ UAFMetadataService ] is intended to provide such information. It is important for the UAF protocol to provide this kind of reliable information about the security relevant parts of the equipment and the authentication method itself to the FIDO server. The overall security is determined by the weakest link. In order to support scalable security in FIDO, the underlying UAF protocol needs to provide a very high conceptual security level, so that the protocol isn't the weakest link. Relying Parties define Acceptable Assurance Levels. The FIDO Alliance envisions a broad range of FIDO UAF Clients, FIDO Authenticators and FIDO Servers to be offered by various vendors. Relying parties should be able to select a FIDO Server providing the appropriate level of security. They should also be in a position to accept FIDO Authenticators meeting the security needs of the given business context, to compensate assurance level deficits by adding appropriate implicit authentication measures, and to reject authenticators not meeting their requirements. FIDO does not mandate a very high assurance level for FIDO Authenticators, instead it provides the basis for authenticator and user verification method competition. Authentication vs. Transaction Confirmation. Existing Cloud services are typically based on authentication. The user launches an application (i.e. User Agent) assumed to be trusted and authenticates to the Cloud service in order to establish an authenticated communication channel between the application and the Cloud service. After this authentication, the application can perform any actions to the Cloud service using the authenticated channel. The service provider will attribute all those actions to the user. Essentially the user authenticates all actions performed by the application in advance until the service connection or authentication times out. This is a very convenient way as the user doesn't get distracted by manual actions required for the authentication. It is suitable for actions with low risk consequences. However, in some situations it is important for the relying party to know that a user really has seen and accepted a particular content before he authenticates it. This method is typically being used when non-repudiation is required. The resulting requirement for this scenario is called What You See Is What You Sign (WYSIWYS). UAF supports both methods; they are called "Authentication" and "Transaction Confirmation". The technical difference is, that with Authentication the user confirms a random challenge, where in the case of Transaction Confirmation the user also confirms a human readable content, i.e. the contract. From a security point, in the case of authentication the application needs to be trusted as it performs any action once the authenticated communication channel has been established. In the case of Transaction Confirmation only the transaction confirmation display component implementing WYSIWYS needs to be trusted, not the entire application. Distinct Attestable Security Components. For the relying party in order to determine the risk associated with an authentication, it is important to know details about some components of the user's environment. Web Browsers typically send a "User Agent" string to the web server. Unfortunately any application could send any string as "User Agent" to the relying party. So this method doesn't provide strong security. FIDO UAF is based on a concept of cryptographic attestation. With this concept, the component to be attested owns a cryptographic secret and authenticates its identity with this cryptographic secret. In FIDO UAF the cryptographic secret is called "Authenticator Attestation Key". The relying party gets access to reference data required for verifying the attestation. In order to enable the relying party to appropriately determine the risk associated with an authentication, all components performing significant security functions need to be attestable. Generating and protecting the Authentication key(s), typically one per relying party and user account on relying party. Providing the WYSIWYS capability ("Transaction Confirmation Display" component). Some FIDO Authenticators might implement these functions in software running on the FIDO User Device, others might implement these functions in "hardware", i.e. software running on a hardware segregated from the FIDO User Device. Some FIDO Authenticators might even be formally evaluated and accredited to some national or international scheme. Each FIDO Authenticator model has an attestation ID (AAID), uniquely identifying the related security characteristics. Relying parties get access to these security properties of the FIDO Authenticators and the reference data required for verifying the attestation. Resilience to leaks from other verifiers. One of the important issues with existing authentication solutions is a weak server side implementation, affecting the security of authentication of typical users to other relying parties. It is the goal of the FIDO UAF protocol to decouple the security of different relying parties. Decoupling User Verification Method from Authentication Protocol. In order to decouple the user verification method from the authentication protocol, FIDO UAF is based on an extensible set of cryptographic authentication algorithms. The cryptographic secret will be unlocked after user verification by the Authenticator. This secret is then used for the authenticator-to-relying party authentication. The set of cryptographic algorithms is chosen according to the capabilities of existing cryptographic hardware and computing devices. It can be extended in order to support new cryptographic hardware. Privacy Protection. Different regions in the world have different privacy regulations. The FIDO UAF protocol should be acceptable in all regions and hence must support the highest level of data protection. As a consequence, FIDO UAF doesn't require transmission of biometric data to the relying party nor does it require the storage of biometric reference data [ ISOBiometrics ] at the relying party. Additionally, cryptographic secrets used for different relying parties shall not allow the parties to link actions to the same user entity. UAF supports this concept, known as non-linkability. Consequently, the UAF protocol doesn't require a trusted third party to be involved in every transaction. Relying parties can interactively discover the AAIDs of all enabled FIDO Authenticators on the FIDO User Device using the Discovery interface [ UAFAppAPIAndTransport ]. The combination of AAIDs adds to the entropy provided by the client to relying parties. Based on such information, relying parties can fingerprint clients on the internet (see Browser Uniqueness at eff.org and https://wiki.mozilla.org/Fingerprinting). In order to minimize the entropy added by FIDO, the user can enable/disable individual authenticators – even when they are embedded in the device (see [ UAFAppAPIAndTransport ], section "privacy considerations"). In order to keep key sizes small and to make private key operations fast enough for small devices, it is suggested that implementers prefer ECDSA [ ECDSA-ANSI ] in combination with SHA-256 / SHA-512 hash algorithms. However, the RSA algorithm is also supported. See [ UAFRegistry ] "Authentication Algorithms and Key Formats" for a list of generally supported cryptographic algorithms. One characteristic of ECDSA is that it needs to produce, for each signature generation, a fresh random value. For effective security, this value must be chosen randomly and uniformly from a set of modular integers, using a cryptographically secure process. Even slight biases in that process may be turned into attacks on the signature schemes. If such random values cannot be provided under all possible environmental conditions, then a deterministic version of ECDSA should be used (see [ RFC6979 ]). There are two concepts implemented in FIDO UAF to prevent malicious applications from misusing AppID specific keys registered with FIDO Authenticators. First concept is called "FacetID Assertion" and second is based on the "KHAccessToken". For information on the FacetID concept see [ FIDOAppIDAndFacets ]. Authenticators might be implemented in dedicated hardware and hence might not be able to verify the calling software entity (i.e. the ASM). The KHAccessToken allows restricting access to the keys generated by the FIDO Authenticator to the intended ASM. It is based on a Trust On First Use (TOFU) concept. FIDO Authenticators are capable of binding UAuth.Key with a key provided by the caller (i.e. the ASM). This key is called KHAccessToken. This technique allows making sure that registered keys are only accessible by the caller that originally registered them. A malicious App on a mobile platform won't be able to access keys by bypassing the related ASM (assuming that this ASM originally registered these keys). The KHAccessToken is typically specific to the AppID, PersonaID, ASMToken and the CallerID. See [ UAFASM ] for more details. On some platforms, the ASM additionally might need special permissions in order to communicate with the FIDO Authenticator. Some platforms do not provide means to reliably enforce access control among applications. Various channel binding methods have been proposed (e.g. [ RFC5929 ] and [ ChannelID ]). Attackers might fraudulently get a TLS server certificate for the same AppID as the relying party and they might be able to manipulate the DNS system. Attackers might be able to steal the relying party's TLS server private key and certificate and they might be able to manipulate the DNS system. UAF transactions might span across multiple TLS sessions. As a consequence, "tls-unique" defined in [RFC5929] might be difficult to implement. Data centers might use SSL concentrators. Data centers might implement load-balancing for TLS endpoints using different TLS certificates. As a consequence, "tls-server-end-point" defined in [RFC5929], i.e. the hash of the TLS server certificate might be inappropriate. Unfortunately, hashing of the TLS server certificate (as in "tls-server-end-point") also limits the usefulness of the channel binding in a particular, but quite common circumstance. If the client is operated behind a trusted (to that client) proxy that acts as a TLS man-in-the-middle, your client will see a different certificate than the one the server is using. This is actually quite common on corporate or military networks with a high security posture that want to inspect all incoming and outgoing traffic. If the FIDO Server just gets a hash value, there's no way to distinguish this from an attack. If sending the entire certificate is acceptable from a performance perspective, the server can examine it and determine if it is a certificate for a valid name from a non-standard issuer (likely administratively trusted) or a certificate for a different name (which almost certainly indicates a forwarding attack). See ChannelBinding dictionary for more details. A web application might trigger FIDO Registration after authenticating an existing user via legacy credentials. So the session is used to maintain the authentication state until the FIDO Registration is completed. After success FIDO Authentication, the session is used to maintain the authentication state during the operations performed by the user agent or mobile app. Best practices should be followed to implement robust session management (e.g. [ OWASP2013 ]). FIDO supports unlinkability [ AnonTerminology ] of accounts at different relying parties by using relying party specific keys. Sometimes users have multiple accounts at a particular relying party and even want to maintain unlinkability between these accounts. Today, this is difficult and requires certain measures to be strictly applied. FIDO does not want to add more complexity to maintaining unlinkability between accounts at a relying party. In the case of roaming authenticators, it is recommended to use different authenticators for the various personas (e.g. "business", "personal"). This is possible as roaming authenticators typically are small and not excessively expensive. In the case of bound authenticators, this is different. FIDO recommends the "Persona" concept for this situation. All relevant data in an authenticator are related to one Persona (e.g. "business" or "personal"). Some administrative interface (not standardized by FIDO) of the authenticator may allow maintaining and switching Personas. The authenticator MUST only "know" / "recognize" data (e.g. authentication keys, usernames, KeyIDs, …) related to the Persona being active at that time. With this concept, the User can switch to the "Personal" Persona and register new accounts. After switching back to "Business" Persona, these accounts will not be recognized by the authenticator (until the User switches back to "Personal" Persona again). In order to support the persona feature, the FIDO Authenticator-specific Module API [ UAFASM ] supports the use of a 'PersonaID' to identify the persona in use by the authenticator. How Personas are managed or communicated with the user is out of scope for FIDO. Data contained in the field serverData (see Operation Header dictionary) of UAF requests is sent to the FIDO UAF Client and will be echoed back to the FIDO Server as part of the related UAF response message. The FIDO Server should not assume any kind of implicit integrity protection of such data nor any implicit session binding. The FIDO Server must explicitly bind the serverData to an active session. In some situations, it is desirable to protect sensitive data such that it can be stored in arbitrary places (e.g. in serverData or in the KeyHandle). In such situations, the confidentiality and integrity of such sensitive data must be protected. This can be achieved by using a suitable encryption algorithm, e.g. AES with a suitable cipher mode, e.g. CBC or CTR [ CTRMode ]. This cipher mode needs to be used correctly. For CBC, for example, a fresh random IV for each encryption is required. The data might have to be padded first in order to obtain an integral number of blocks in length. The integrity protection can be achieved by adding a MAC or a digital signature on the ciphertext, using a different key than for the encryption, e.g. using HMAC [ FIPS198-1 ]. Alternatively, an authenticated encryption scheme such as AES-GCM [ SP800-38D ] or AES-CCM [ SP800-38C ] could be used. Such a scheme provides both integrity and confidentiality in a single algorithm and using a single key. When protecting serverData, the MAC or digital signature computation should include some data that binds the data to its associated message, for example by re-including the challenge value in the authenticated serverData. Several authenticator properties (e.g. UserVerificationMethods, KeyProtection, TransactionConfirmationDisplay, ...) are available in the metadata [ UAFAuthnrMetadata ] and through the FIDO UAF Application API. The properties included in the metadata are authoritative and are provided by a trusted source. When in doubt, decisions should be based on the properties retrieved from the Metadata as opposed to the data retrieved through the FIDO UAF Application API. However, the properties retrieved through the FIDO UAF Application API provide a good "hint" what to expect from the Authenticator. Such "hints" are well suited to drive and optimize the user experience. FIDO UAF Response messages do not include all parameters received in the related FIDO UAF request message into the to-be-signed object. As a consequence, any MITM could modify such entries. FIDO Server will detect such changes if the modified value is unacceptable. For example, a MITM could replace a generic policy by a policy specifying only the weakest possible FIDO Authenticator. Such a change will be detected by FIDO Server if the weakest possible FIDO Authenticator does not match the initial policy (see Registration Response Processing Rules and Authentication Response Processing Rules). The TLS protocol by itself protects against replay-attacks when implemented correctly [ TLS ]. Additionally, each protocol message contains some random bytes in the ServerChallenge field. The FIDO server should only accept incoming FIDO UAF messages which contain a valid ServerChallenge value. This is done by verifying that the ServerChallenge value, sent by the client, was previously generated by the FIDO server. See FinalChallengeParams. It should also be noted that under some (albeit unlikely) circumstances, random numbers generated by the FIDO server may not be unique, and in such cases, the same ServerChallenge may be presented more than once, making a replay attack harder to detect. FIDO UAF relies on the UAuth.Key to be protected and managed by an authenticator with the security characteristics specified for the model (identified by the AAID). The security is better when only a single authenticator with that specific UAuth.Key instance exists. Consequently FIDO UAF specifies some protection measures against cloning of authenticators. Firstly, if the UAuth private keys are protected by appropriate measures then cloning should be hard as such keys cannot be extracted easily. Secondly, UAF specifies a Signature Counter (see Authentication Response Processing Rules and [ UAFAuthnrCommands ]). This counter is increased by every signature operation. If a cloned authenticator is used, then the subsequent use of the original authenticator would include a signature counter lower to or equal to the previous (malicious) operation. Such an incident can be detected by the FIDO Server. Authenticators might support a Registration Counter (RegCounter). The RegCounter will be incremented on each registration and hence might become exceedingly high in such fraud scenarios. See [ UAFAuthnrCommands ] for more details. FIDO supports Web Applications, Mobile Applications and Native PC Applications. Such applications are referred to as FIDO enabled applications. Mobile Apps play the role of the User Agent and the Web App (Client). The protocol between the Mobile App and the Relying Party Web Application Server is typically proprietary. Native PC Applications play the role of the User Agent, the Web App (Client). Those applications are typically expected to be independent from any particular Relying Party Web Application Server. It is recommended for FIDO enabled applications to use the FIDO messages according to the format specified in this document. It is recommended for FIDO enabled application to use the UAF HTTP Binding defined in [ UAFAppAPIAndTransport ]. The KeyRegistrationData and SignedData objects [ UAFAuthnrCommands ] are generated and signed by the FIDO Authenticators and have to be verified by the FIDO Server. Verification will fail if the values are modified during transport. The ASM API [UAFASM] specifies the standardized API to access authenticator Specific Modules (ASMs) on Desktop PCs and Mobile Devices. The document [ UAFAuthnrCommands ] does not specify a particular protocol or API. Instead it lists the minimum data set and a specific message format which needs to be transferred to and from the FIDO Authenticator. This Assertion Scheme allows the authenticator and the FIDO Server to exchange an asymmetric authentication key generated by the Authenticator. This assertion scheme is using Tag Length Value (TLV) compact encoding to encode registration and authentication assertions generated by authenticators. This is the default assertion scheme for UAF protocol. TAGs and Algorithms are defined in [ UAFRegistry ]. The authenticator MUST use a dedicated key pair (UAuth.pub/UAuth.priv) suitable for the authentication algorithm specified in the metadata statement [ UAFAuthnrMetadata ] for each relying party. This key pair SHOULD be generated as part of the registration operation. Conforming FIDO Servers MUST support all authentication algorithms and key formats listed in document [ UAFRegistry ]. Conforming authenticators MUST support at least one Authentication Algorithm and one Key Format listed in [ UAFRegistry ]. See [ UAFAuthnrCommands ], section "TAG_UAFV1_KRD". See [ UAFAuthnrCommands ], section "TAG_UAFV1_SIGNED_DATA".